Zombie Hunter King is a new addition to the ever-expanding zombie shooter niche. 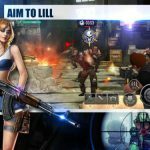 Mobirix’s new zombie-themed mobile game is simple, fun to play, and filled with lots of undead that just wait to run into your gun. Simplistic graphics help players to be better at spotting and shooting zombies. Instead of being fascinated by visuals and blinded by many shiny effects, you will look at the game, see it looks okay and then starts blasting some brains. Simple visuals aren’t a bad thing because in this type of video games it is better to be able to stay focused on enemies instead of being amazed by shiny lighting, detailed models, superb animation, and attention-grabbing special effects. Zombie Hunter King is spaced across multiple game modes that include your classic single-player campaign that contains a huge number of levels, a survival mode that’s great to check out how strong is your weapon arsenal, and a multiplayer mode where you compete with other players in being faster in killing the zombie horde. When it comes to difficulty, Zombie Hunter King is a game that starts light but instead becoming immensely hard at one sudden point, it uses a system that makes levels gradually harder, allowing players to adapt and to acquire better weapons by unlocking achievements. The main game mode, the campaign is filled with hundreds of levels that share a common goal – fending off multiple waves of zombies until they get bored of attacking you. You get coins and diamonds for finishing levels, unlocking achievements, and by playing the game on a regular basis. 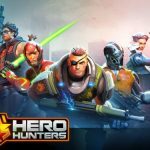 There are super bosses that also give prizes upon you kill them and we have to say that Zombie Hunter King is one of the most generous free-to-play titles when it comes to the number of diamonds players can earn by simply playing the game. This means that, with smart diamond investments, players can build a powerful weapon arsenal and to play the campaign without having to spend money on buying diamonds. Coins and diamonds are also earned by unlocking achievements and since there are many of them that can be unlocked repeatedly (like the ones that include killing a certain number of zombies with specific weapon types, or landing a specific number of headshots) tenacious players can earn lots of coins and diamonds, enough for getting some powerful weapons and strong cards. Yes, Zombie Hunter King features a card system where cards give various passive and active bonuses. For an active bonus to have an effect, it has to be equipped in a card slot. On the other hand, passive bonuses are always in effect, as long as you have a card in your deck. Multiplayer and survival modes give prizes each week, so the better you are against other players and the longer you survive the endless horde of survival mode, the better your chances are on scoring high at week’s end. Now, after a while Zombie Hunter King can become pretty hard and unforgiving but since we played the game for dozens and dozens of hours we found many ways to get better and to advance the campaign without paying real-world money. Stay with us and check out our Zombie Hunter King cheats, tips and tricks to find out how to save the world from the undead! Headshots are worth double damage so always aim for the head. Since almost all zombie types are of the same height it is best to simply keep the aiming reticle at one point on the screen and then just swoosh the weapon left and right. While not the most accurate way of killing enemies, this strategy will ease your aiming and land lots of headshots. Of course, do not follow this strategy blindly; there are lots of different enemies and some are shorter or taller than others so feel free to aim for their head when they appear. Now, during early game we advise you to shoot enemies just with headshots because the game offers a series of achievement for pulling out consecutive headshots (20, 50, 100) so try pulling out just headshots because unlocking those achievements will grant you lots of coins early on, allowing for lots of weapon upgrades. Tommy Gun is the first weapon you get in Zombie Hunter King and while the starting weapon stops being useful after a while in other, similar zombie shooter, it can stay pretty strong in Zombie Shooter King, even after many hours of playtime. Do not abandon the starting weapon, and do not abandon any weapon you buy after. They all can be helpful because it’s always better to shoot from an automatic rifle than from a simple handgun. And yes, your handgun simply isn’t worth upgrading. 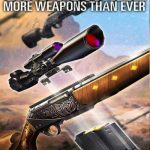 Now, you should upgrade Tommy Gun as well as your first shotgun to the max level because they will be solid choices even later when zombies become much, much stronger. Also, the game is built so that you cannot finish any level with just one weapon; you will simply spend all bullets and then be limited to your handgun, which is the worst possible weapon to have. So, just keep every weapon you buy. That way you will always have a relatively strong weapon to choose from once you spend all bullets used in your primary weapon. We use two submachine guns, one automatic rifle, and two shotguns and are able to finish any level with a couple of guns being filled with bullets. This is way better than simply using just one weapon because you will stay without bullets on harder levels and then Zombie Hunter King will look like another free title that’s impossible to beat without spending real cash. And that’s not the case, believe us. The MP5 and K-2 are pretty powerful weapons, and they can be unlocked relatively easy. Also get the first shotgun that gets unlocked (M1887) because it is very powerful, especially once upgraded to the max level. Now, let’s talk about unlocking the MP5 and K-2. The first one gets unlocked once you have 30 cards in your deck. To accomplish this you have to buy one card deck upgrade, and then just collect cards. Because the game counts card copies as separate cards, you should be able to acquire 30 cards even though the first card deck upgrade gives you only 28 card slots. Once you buy MP5, it is time to upgrade it a couple of times (your Thompson and M1887 should be upgraded to the max level by this time) and then hunt for K-2. The K-2 is available once you amass 40,000 points in survival. Just play the mode with all three weapons (the Thompson, MP5, and the shotgun). Use the handgun until it becomes too inefficient for most zombies (until it takes you more than 3 headshots to kill that sailor-shirt zombie) and only then switch to the first weapon. You should also equip any card that gives you bonus points (there are some passive ones that always give bonus points), like the one that gives you more points for headshots. Your point power should be upgraded to level 10 and you should have at least 3 hand grenades to use if you end up with just your gun at the end and needing a couple of thousands of points to reach 40K points. Now that you secured the K-2 you will have enough weapons to play the game for days without needing an additional weapon. And before we continue, another advice. The next weapon that can be unlocked (but much harder) is the P90. This one is a beast and it is unlocked once you have 10 cards that are B level or greater. So, do not sell B level cards because the P90 is one of the strongest weapons in Zombie Hunter King! 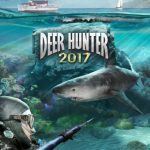 In Zombie Hunter King you’ll earn lots of diamonds but best weapons are extremely expensive to unlock by using diamonds. It is better to unlock them by simply fulfilling their unlock requirements. We already explained how to unlock three powerful weapons so skip spending diamonds on unlocks. And even if you spend hundreds or thousands of diamonds on unlocking a certain weapon, you will still have to buy it with coins, so it is better to just spend diamonds elsewhere. And try saving up coins once you know you will unlock a weapon soon so you can buy it right away upon it gets unlocked. Now, we told you that you should get one card deck to upgrade. And once you get that upgrade you should spend diamonds exclusively on buying cards. That way you will get some pretty powerful cards and will also get enough B level or greater cards to unlock the P90. Also, do not spend coins on getting cards; it just isn’t worth it. Even with diamonds, you will rarely get a B level card. With coins, 99 out of 100 you will get a D level card. You get one card slot to equip active cards on every ten levels, so choose wisely which ones you want to activate. Of course, you could unlock additional slots for diamonds but this isn’t needed because if you followed our advice regarding unlocking weapons you should have more than enough firepower. The best cards are those that increase basic damage output so if you have some for weapon types you play with, equip them. Even a ten or twenty percent of damage increase can be pretty strong if you have upgraded weapons. Next, another incredible card is the one that increases damage from headshots. If you get one to be sure to equip it because that one is extremely powerful to have. Also, if you use K-2, equip a card that speeds up reloading automatic rifle because the weapon is great aside from its long reload time. Ammo cards (more ammo to start with and the card that gives you a chance to collect ammo in levels) are also pretty good picks. And when you play survival mode in Zombie Hunter King, you should equip special cards, especially those that increase points of killing zombies and for landing headshots. This way you will be able to amass more points and to get better prizes at week’s end. Also, feel free to sell cards you don’t need, just do not sell B level or greater cards, even if you don’t need them, because you will need to own 10 of them in order to unlock the P90, which is one of the best weapons in Zombie Hunter King. After ten levels or so you will be able to fight against a boss. He’s always the same and he cannot be shot in the head. Because of this, shotguns, especially the first one when upgraded to the max level, are great against him. It is because he’s huge and shotguns fire many pellets meaning they will induce much more damage per shot than regular, automatic weapons. So, when facing boss use a shotgun. Shotguns are also great for bonus levels because they can kill lots of those flying eyes with one shot, much more than automatic weapons can (except the P90, that’s the ultimate weapon for bonus levels). Now, while the boss is pretty easy to beat at the start, each new encounter will give him more HP and higher damage so try equipping special cards (that increase damage to the boss, and that increase shotgun damage and critical) before facing him. You don’t have to do it right away, but special cards are needed after you face him a couple of times. You have three skills; HP, Damage, and Points. The first one increases your hit points, the second one increases damage with weapons (one percent for each level) and the third one increases the number of points you get for killing the undead. Now, Points skill can be valuable only in survival mode so you don’t have to upgrade it too many times, especially after you score 40K points and unlock the K-2. HP also is aplenty, so upgrade that one only when you start struggling in the campaign and during Boss battles. And damage can be upgraded during later stages after your weapons become too expensive to upgrade because upgrading it will increase damage for all weapons. It is better to spend, let’s say 60K coins and get five percent weapon damage increase than to upgrade the MP5 or the K-2 to level six or seven for the same amount of money. Of course, this doesn’t mean you shouldn’t upgrade your weapons. It’s just that some of them are pretty expensive to upgrade and sometimes it is better to increase Damage a couple of levels than to upgrade a weapon just once. Do not worry about your grade on levels is low because they don’t matter. Only S grade matters because it gives you one free card coupon. You earn better grades by killing more zombies, but the game will limit your max grade when you get hit. You can get an S grade on a level if you get hit only once (or twice on harder levels) but three or more hits and that’s A grade or lower. So, instead of quitting a level after you get hit a couple of times it is better to play it until the end and then replay it later because in Zombie Hunter King you earn lots of repeatable achievements that give lots of coins so it’s better to play a level two times than to quit midway through it. Also, it is better to play new levels and revisit old ones after you upgrade your weapons or get new ones instead of trying to earn a better grade right away. And you shouldn’t worry about not getting S grade because these free card coupons are regular ones; they will give you plain, D level cards most of the time. Zombie Hunter King offers a couple of daily achievements that are pretty valuable. The game gives you 150 diamonds each day after you play campaign 10 times and 150 diamonds for playing survival 10 times. You don’t even have to beat any level, just to play the campaign 10 times. You can die and it will still count towards fulfilling the achievement. So, try unlocking these two achievements because they will give you lots of diamonds you can later use to get some powerful cards. Okay, folks, that’s all for now. We hope you enjoyed reading our Zombie Hunter King beginner’s guide. The game is a blast to play and with the help of our tips, tricks and cheats, you should be able to play it for weeks without spending a dime. Thanks for reading and happy gaming!